BlackBerry Bold debuts in Chile | BlackBerry Blast! Chilean mobile telecom Movistar, is the first carrier in the world to put offer the BlackBerry Bold. It should have been Rogers or AT&T, but the BlackBerry Bold has made its debut in Chile. 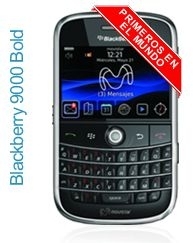 The BlackBerry Bold from Movistar will sells for 299,900 Chilean pesos. That's $588 in the US with a 2 year contract. That's pricey.